An Opinion On Sports: Steve Williams: Disparaging Words From "Down-Under"
Steve Williams: Disparaging Words From "Down-Under"
Tiger Woods' caddie, Steve Williams, called golfer Phil Mickelson a "prick". He also said the two pros 'don't get along', and he took a shot at Phil's weight. Woods was said to have been disappointed in his caddie, and he released a statement saying that the matter had been "discussed and dealt with". Mickelson's side referred to Williams' remarks as inaccurate and irresponsible. That's a good way to keep the PGA's 'down time' interesting. Everyone has always wondered about the Mickelson/Woods competitive relationship, and this little bit of 'charity event chatter' just adds more speculation to it. 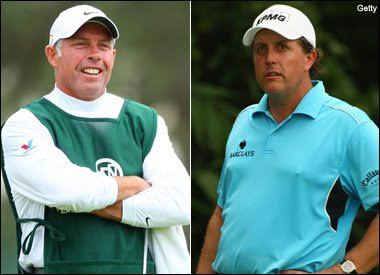 But if I were Phil, I wouldn't lose too much sleep over what Steve Williams said about me. Not some guy who has already thrown a photographer's $7,000 camera into a lake, wrestled another one away from an off-duty police officer, and has been fined on several occasions by the PGA for inappropriate attire. With these latest remarks, along with these past actions, I don't consider Mr. Williams character in line with that of the game he represents.